Called “disgraceful,” “third-rate,” and “not nice” by Donald Trump, NBC News correspondent Katy Tur reported on—and took flak from—the most captivating and volatile presidential candidate in American history. Unbelievable is her darkly comic, fascinatingly bizarre, and often scary story of how America sent a former reality show host to the White House. It’s also the story of what it was like for Tur to be there as it happened, inside a no-rules world where reporters were spat on, demeaned, and discredited. Tur was a foreign correspondent who came home to her most foreign story of all. I started in November, had to return to the library, re-borrowed and finished this month. Despite my break in reading it due to travels, I flew through this book when I was able to sit down and devote some time to it. It’s a compulsive page turner, even if you know the main events and outcome. It’s not an insider’s tell-all of the running of Trump’s campaign or packed with juicy untold scandals, but rather a pro reporter’s experience covering the most bizarre and disorganized campaign ever. Tur does a great job making you feel like you were by her side through this utter horrifying madness. 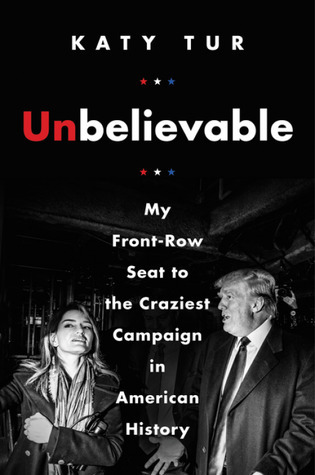 She goes into detail of what it was like covering Trump from beginning to end of the last election season, more than 500 days—sleep deprivation, competition, frustrations, personal and professional sacrifices, constant traveling, the readiness to be on-air with commentary at a moment’s notice, and professionally handling Trump’s incessant lies and attacks every day. Tur’s shifting timeline from chronological campaign coverage to ending each chapter with vignettes from election night at Trump’s headquarters helped add depth and (for me) a palpable sense of dread, because obviously you know how this book ends. I never attended a Trump rally—I only know what was reported on them in the media—and Tur deftly describes the hostile, toxic atmosphere found at his rallies. I was genuinely worried about her and her fellow reporters’ safety reading this; they were held in pens and verbally attacked by Trump onstage, leading to threats from the crowd… not to mention Trump’s confusing, seemingly personal (both negative and positive) focus on Tur herself. I appreciate that Tur gives Trump supporters the benefit of the doubt in her book—I didn’t have a sense of “us vs. them” here—however, I personally think she might be a bit too generous to them. But, discussion of American society’s racist, bigoted, misogynistic underbelly is hefty enough for several other books and not the purpose of this memoir. Tur is a skilled and shrewd journalist and this is another great political memoir to come out this year. Read ebook in November–December 2017. This entry was posted in books and tagged american history, ebook, history, journalism, memoir, non-fiction, politics by kristin @ my little heart melodies. Bookmark the permalink. This sounds fascinating, both as a look back at the election and as a glimpse into what it’s like to be a journalist. I’m not sure I’m ready to think about Trump this much yet though; just following the news is more than enough! I hear you… it was a lot… but of course now I have Fire and Fury on hold…!